The world has changed and so too has investing. The market is shell shocked and yesterday's momentum stocks are today's slow-motion stocks. But in the new reality of low-growth investing, commodities are hot and getting hotter. A rapidly industrializing and urbanizing Asia will be demanding lots more copper, zinc, iron ore, coal, fertilizers, gold and oil to transform their societies. Commodities are it and that's great news for investors who want to profit from the next great bull market in commodities. In fact, commodities may be about the only asset class that is likely to outperform the broad market in the future. Although they are without a doubt important to the global economy, commodities are among the most misunderstood of all asset classes. Stocks, bonds and real estate all have legions of followers and plenty of experts agree on their importance within an investment portfolio, but venture into the world of commodities and you are into an area that's intimidating to the average investor, where suspicions run deep and understanding is limited. As a result, commodities get short-shrift in most investment accounts and investors miss out on some important opportunities. 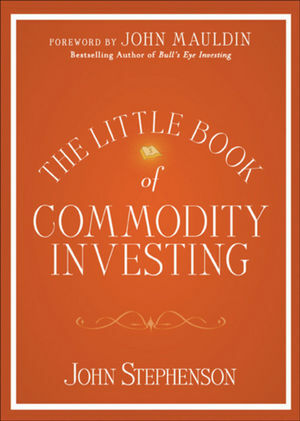 The Little Book of Commodity Investing is an indispensible guide to learning the ins and outs of commodity investing. It's about identifying opportunities to profit from the coming bull market in commodities. It explains the benefits of commodities as part of a well diversified investment portfolio; covers all of the major commodities markets; what makes commodities and the companies that produce them tick; why commodities sometimes zig and then zag; what to buy and when to buy it; and why commodities are the next big thing. Today's world is a very different world-a world where an understanding of commodities is a prerequisite for investment success. And The Little Book of Commodity Investing is the roadmap you need to discover where the opportunities of the future lie, and what to do about it. John Stephenson is a senior vice president and portfolio manager with First Asset Investment Management Inc., where he is responsible for a wide range of equity mandates with a particular focus on energy and resource investing. John is the author of Shell Shocked: How Canadians Can Invest After the Collapse and writes a free bi-weekly investment newsletter, Money Focus. He is regularly quoted by Bloomberg News, Reuters and The Wall Street Journal and is a frequent guest on Bloomberg TV and Canada's Business News Network (BNN) and the CBC. He was recently recognized by Brendan Wood International (BWI) as one of Canada's 50 best portfolio managers. John holds a degree in Mechanical Engineering from the University of Waterloo, an MBA from INSEAD, as well as the Chartered Financial Analyst (CFA) and Financial Risk Manger (FRM) designations. He lives in Toronto. Chapter One: Calling on Commodities: Why Commodity Investing Is a Savvy Bet. Chapter Two: Gettin' Goin': Companies or Commodities? Chapter Three: Gusher: Investing in Oil. Chapter Four: Drilling for Dollars: Profiting from Natural Gas. Chapter Five: Going for Gold: Prospering with Gold and Precious Metals. Chapter Six: Digging It: Making Metals and Mines Work for You. Chapter Seven: Betting the Farm: Bingeing on Food Inflation. Chapter Eight: Ordering the Breakfast Special: Finding Profits in Foodstuffs. Chapter Nine: Gaining in Grains: Investing in Grains. Chapter Ten: Bulk Up: Benefitting from Bulk Commodities. Chapter Eleven: Capitalizing on Commodities: Why Commodities Are Happening.